Now, there’s the Galaxy View. 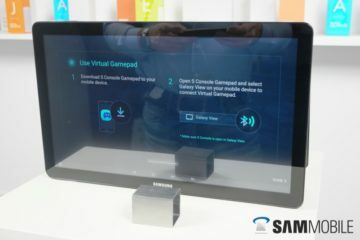 Samsung is positioning this device as a “Movable Display” instead of a tablet, which might not be a bad thing considering it has a giant display. We have been using the Galaxy View for a while and now we’re here to share our experience with you. The size of the Galaxy View is striking, which is to say it is massive. 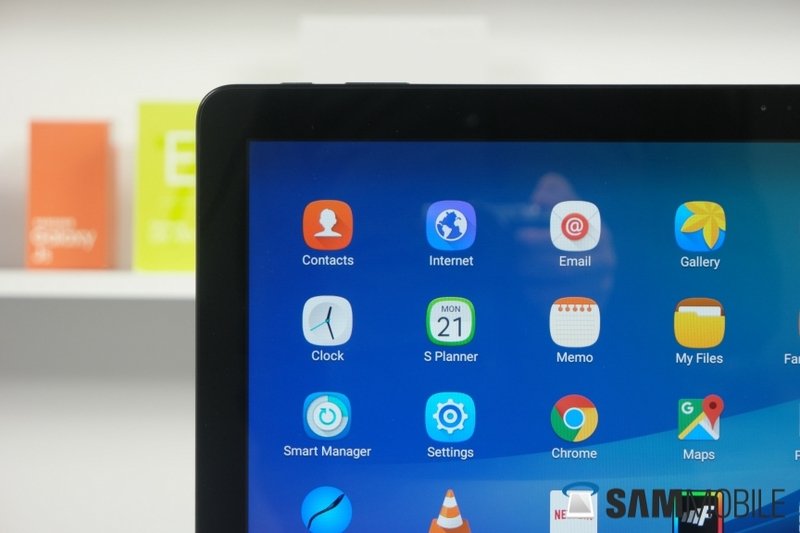 It has an 18.4-inch display and it lacks a home button (a move that some might say was a long time coming, though there is a reason the Galaxy View doesn’t have a home button: it’s not meant to be used as a regular device.) 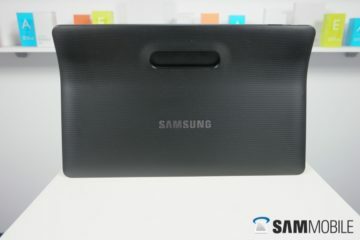 The front has a black bezel surrounding the screen and at the top we see a 2.1-megapixel front camera and the Samsung logo. On both sides the device houses two enormous 4 Watt speakers. On the back there is a plaid-like pattern and a hard plastic carrying handle that can be used in two ways. At the top there is a power button and the volume rockers. As you can see it is not too shabby, but it is a plain and rather dull device. 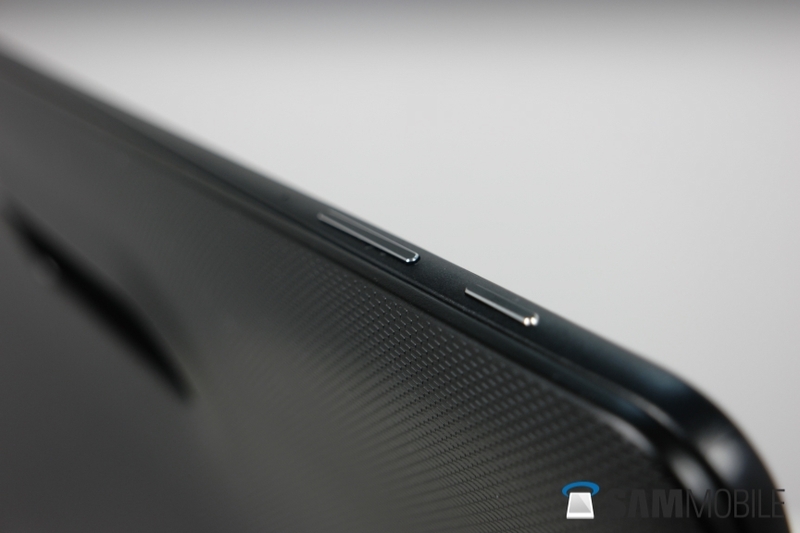 On the lower back side we see a sliding cover where you can insert an SD card (up to 128GB). The weight is rather heavy at 2.65 kilos, so it’s not a device you can walk around with and it’s impossible to carry the Galaxy View in your backpack. The device is designed to stand up or lie down on a tablet. Laying it on a table is where you find a problem – Samsung wanted to have big speakers on the Galaxy View so it cannot be laid entirely flat on a surface. These speakers aren’t really that great, either; they’re loud but the sound is a little dull. The size of the Galaxy View is also a minus point. It’s not a device you can put somewhere in a drawer or put it in the middle of a dining table. The unit is very bulky, it is always in the way, and if it were up to me I would go for a somewhat smaller size. 14 to 15 inches would have been the sweet spot – the screen would have been large and the device would have been stowable as well. 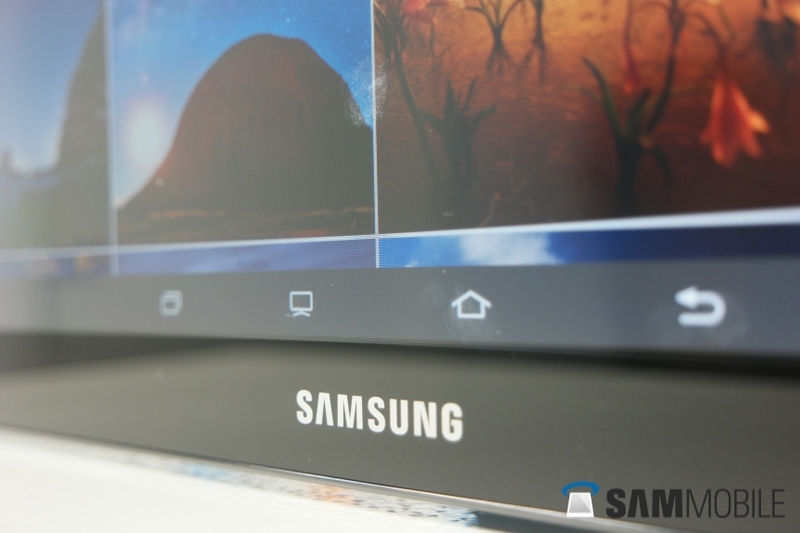 The Galaxy View comes with a Full HD display (1920×1080 pixels). It’s the resolution most content is created for, so the choice isn’t exactly strange. The pixel density is around 120 ppi, and you can tell that isn’t much for an 18.4-inch display. 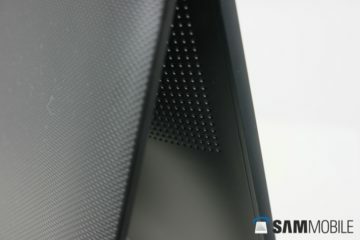 You can easily spot individual pixels when you’re using the Galaxy View for things like browsing, which you would do at a close distance. Speaking of distance, from larger distances the Galaxy View’s display is just sharp enough – think of a 50-inch Full HD TV at home, and the Galaxy View is pretty much as sharp when kept at the proper distance for media viewing. The screen has bright colors but unfortunately lacks contrast. The color white leans a little towards blue and gives off a cold feeling. The screen also has issues displaying dark colors, and some parts of the shadows just dissolve. Frankly, it’s a shame on a device that is created for content consumption. 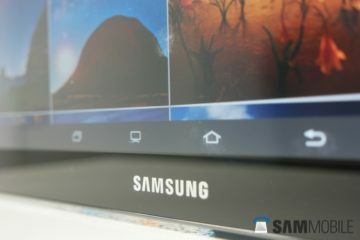 Samsung says there is no AMOLED display on the Galaxy View as it would drive its price too high, and the decision has affected the overall viewing experience. 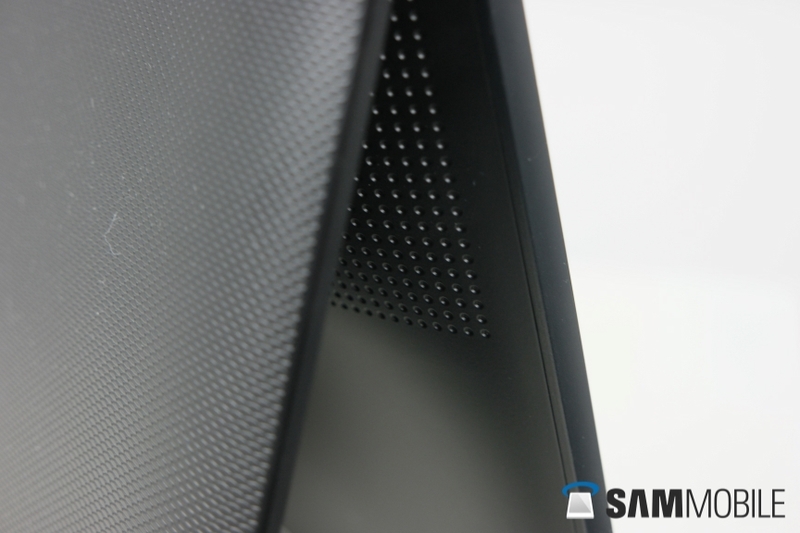 Check out a detailed analysis of the Galaxy View’s display here. The Galaxy View runs Android 5.1.1 Lollipop, and it is the same version of TouchWiz as we know from other Samsung tablets, with features like Popup Window and multi user support. The Galaxy View will be used by more than one person in a family, so the multi user support is quite welcome. Since a device tends to be supported by Samsung for 18 months, we expect the Galaxy View to get Android 6.0 Marshmallow. Marshmallow’s Doze feature will be particularly useful – Doze saves battery life in standby, and since the Galaxy View is most likely to be used in the evenings and remain in standy during work hours, Doze will be of great help in preserving battery life. 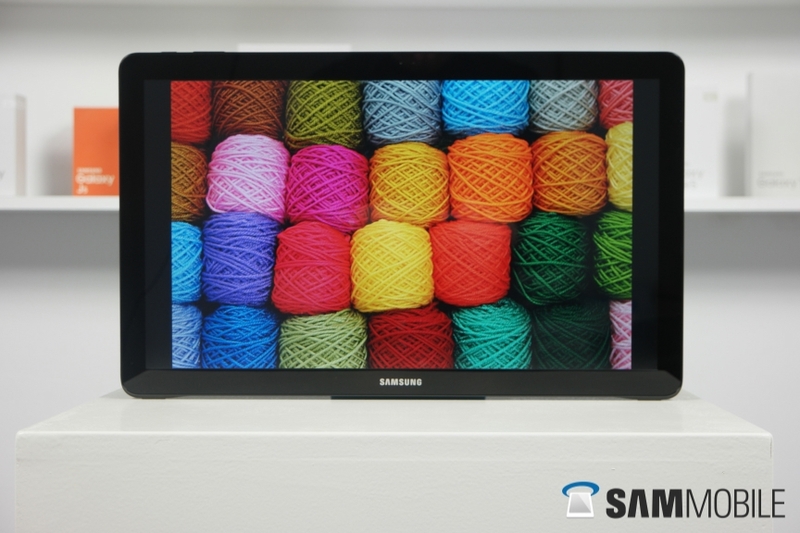 Samsung has a dedicated Media Hub installed where various links are posted. These links refer to different apps in the Play Store. Think HBO Go, Fox Sports and a few other apps (depending on where you live.) The sad thing is that you cannot add or remove apps in the dedicated media hub, though the apps that don’t show up in the hub will be accessible from the normal home screen. Another new app the Galaxy View introduces is Family Square. 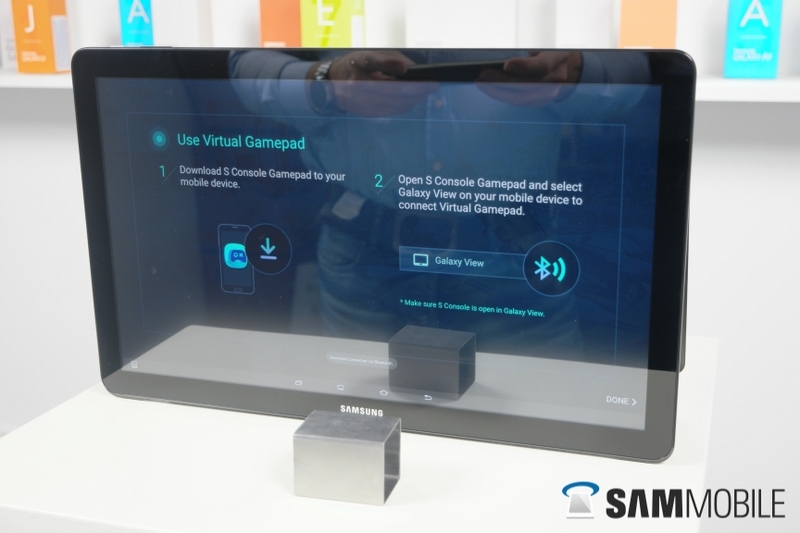 Family Square is an app that lets different devices connect to the Galaxy View, so that everyone can easily share photos, videos and their calendars with the movable display. It’s handy, as everyone can find each others’ content and appointments in a central location. Think of it as a command center in the house. The Galaxy View can also become a big photo frame once should you want. One big annoyance on the Galaxy View is the lack of something like a “tap to wake” function, as every time you need to wake it up you need to press the power button, which becomes annoying and is something Samsung should have thought about when it removed its iconic home button from the device. S Console Gamepad is another nice app. 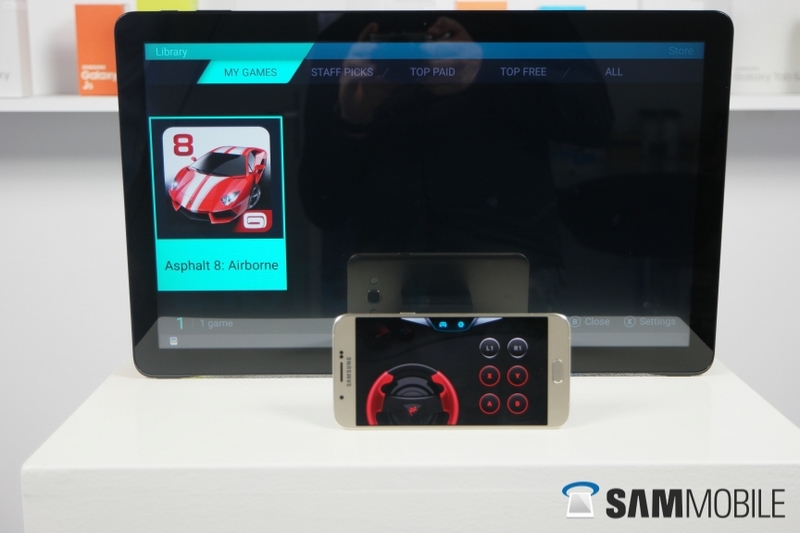 It turns your phone into a gamepad, which is very handy. I tried a racing game and it worked just fine. The app automatically selects the right style of controller based on a game, so playing a racing title will get you a steering wheel with pedals on the phone screen and playing FIFA will give you a traditional gamepad on-screen. A pleasant surprise was the keyboard. Samsung clearly thought the keyboard out very well; it’s the best we have seen on a tablet so far, especially since you have the space for a full-size keyboard. With the arrow keys it is easy to make adjustments and even a separate numerical keyboard is available. 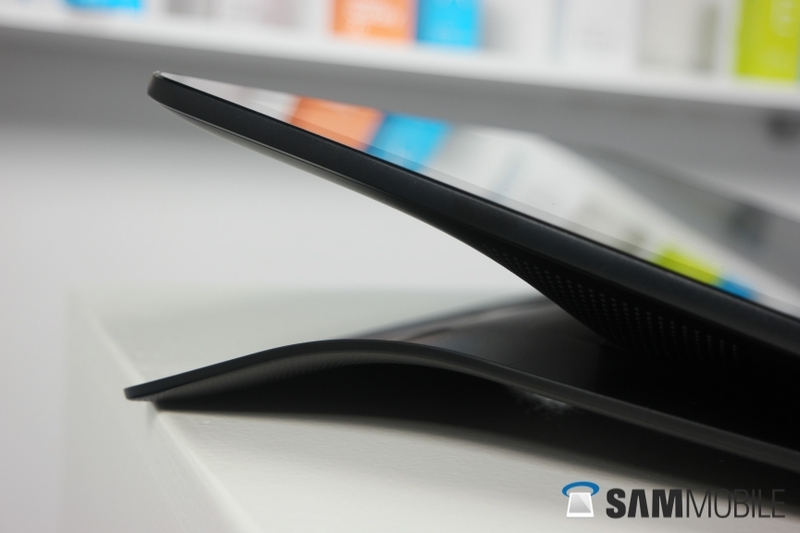 Typing on the Galaxy View was extremely easy and convenient. If we look at the performance of the device, it’s not the worst but not the best either. Games like Real Racing 2 and FIFA 2016 ran fine on the 1.6GHz processor, and video playback was good, too. Casual usage like browsing the web isn’t a problem either. However, the 2GB of RAM does result in annoying lag if you are a heavy multitasker. 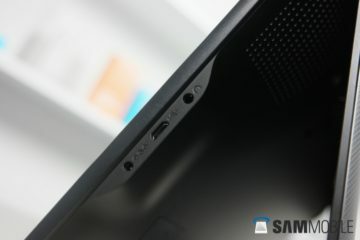 There is 32GB of storage on the Galaxy View, and since this is a media center-like device that will be used by several family members, the microSD slot that takes up to 128GB cards means storage space should not be a concern. 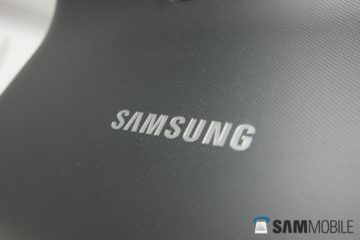 The 5,700 mAh battery on the Galaxy View does surprisingly well. It could last about seven to eight hours and managed to make it to even 10 hours with regular usage. The standby time could have been better, as leaving the Galaxy View idle saw the battery going from full to empty within a few days. Again, Marshmallow should help thanks to the Doze feature in terms of standby endurance. Overall, we are quite surprised by the battery life on the Galaxy View, and you shouldn’t have much to complain about at the end of the day, unless you are using the device for long periods of time like a smartphone or regular tablet. The idea of a movable display is not all that crazy, as not everyone has a TV in every room at home. So the Galaxy View (a rechargeable TV) would be an ideal solution for many, though the reality is unfortunately a bit different. The price is way too high, and Samsung’s implementation of a great idea leaves much to be desired. The screen is only Full HD and not good enough, and there could have been more RAM on the device. It’s too bad, actually – I was rather excited about the Galaxy View at first, but it is a device I wouldn’t recommend to anyone. If it might be cheaper for, say 200 Euro, it would have been worth recommending. But for now, the price is way too high. It’s ridiculous why Samsung wouldn’t add rotation toggle or even the function. I have the Samsung Galaxy View, it doesn’t let you rotate the screen even with an application that should be able to force it. the screen rotates but landscape, so portrait in landscape. phone view in landscape with small buttons. lmao don´t ever change your Note Pro for this horror. Your device is intended for the most demanding users while this thing is for a family home where someone uses it occasionally for playing a movie. Now, if it had been equal? THAT I would’ve seriously considered. I use my NotePro for art&media a lot, and I would’ve loved 18.4″ with powerhouse specs…. Can you imagine doing artwork on that? It’d be an affordable portable alternative to my Cintiq! You do realise this was never ever intended to replace any tablet, let alone the brilliant note pro 12.2? This is meant to sit in a room somewhere as a interactive screen, viewed from a distance to entertain kids with their favourite programme on repeat or displaying a recipe in the kitchen. For that it doesn’t need any higher specs, what it does need is a lower price.